Exit I-90 at the Vantage Bridge over the Columbia River, and continue 41 miles east on Route 26 to Othello, where the refuge office is. Be sure to pick up a map at the office. Birding is most productive from March to June and during September, before seasonal closure of the sanctuary across 2/3 of the refuge from October through February. 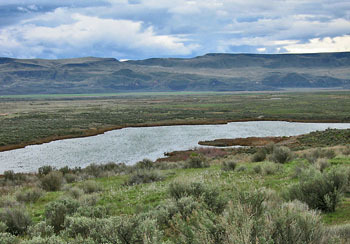 The Coulee Corridor Scenic Byway route of the Great Washington State Birding Trail describes nine stops at Columbia NWR. The Corfu area, 12 miles west of Othello, south of Route 26, is the best area for viewing Sandhill Cranes in March and early April, and the woodland along Corfu Road is excellent for migrant songbirds in May. Royal Lake (overlook and kiosk at Byers Road x Road 14.8 SE) hosts abundant waterfowl from October to April. A 23-mile loop starts 5.5 miles northwest of Othello at the intersection of Morgan Lake Road and McManamon Road (Broadway Avenue north from Othello.) Traveling counter-clockwise, take Morgan Lake Road to Route 262 (O'Sullivan Dam Road), then west to Mardon. Next, turn at Road H SE, then go south to McManamon Road (which in Grant County is called Road 12 SE) and return to Morgan Lake Road. The loop includes stops at Marsh Unit 1 (marsh- and shorebirds, spring and summer), the Crab Creek Trail (riparian shrub, especially May through June and September), and the Frog Lake and Marsh Trails (marsh and shrub-steppe, best April and May). Warning: While rattlesnakes are quite timid, they are common from May to September, as are ticks along trails. Hunting is allowed in areas open to the public (Marsh Unit 1, Corfu).